The summer-like temperatures we've been enjoying did more than force us to shed those winter layers and think spring, almost without questioning a return to winter as what hit the Midwest hard last year. The warm weather left us pulling out the shorts, tanks and swimsuits; digging out the beach towels, tennis racquets, volleyballs and softballs; dusting off the running shoes, inline skates and cruisers; and swapping out the training tire for the road tire on the bike that became a living room fixture in the off-season. Sounds like a garage sale, but that's just us getting ready for spring and summer. If you want a garage sale though, you're in luck because Vision Quest Coaching and newly renovated Trek Store of Highland Park are hosting one later this week. As you dust off those bikes, are you noticing the wheel you said you'd upgrade later, the saddle you promised yourself you'd replace in the winter, the hoods and bar ends in desperate need of re-taping? Or are you staring at your go-to bike, telling yourself that as much as you love it and all the miles you've logged on it, you really want to splurge on an upgrade (sorry, bike, I love ya but I can do better)? Perfect reason to check out the events at Trekfest 2010 where you can trade up, shop or unload items gathering cobwebs in the closet that could be someone else's treasure. 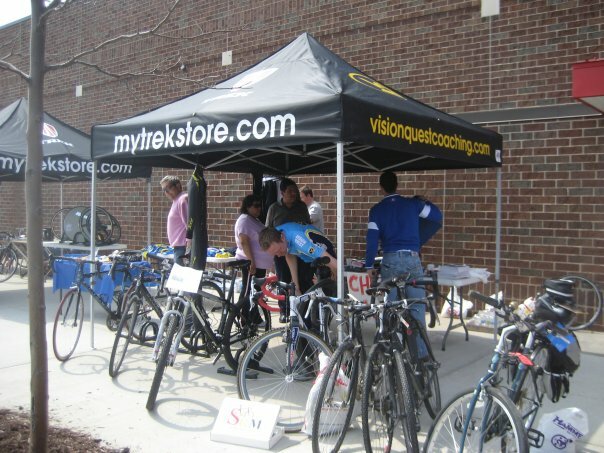 Trekfest starts Wednesday, April 7, and runs through Saturday, April 10 at the Trek Store at 1925 Skokie Valley Road in Highland Park, Ill. You'll be able to visit the store to ogle the latest and greatest bikes on the market, receive first-hand advice from elite athletes, and get discounts on purchases. There's even more in store on Saturday, April 10 when Drag, Push or Pull and Vision Quest Coaching's Fourth Annual Sidewalk Sale take place. Drag, Push or Pull encourages you to pull those old bikes out of the garage that are only collecting dust not riding miles and donate them for charity. As long as you can drag, push or pull the bike to the store, Trek will reward you with $50 toward a new bike purchase, and your bike will be donated to Working Bikes Cooperative, which repairs bikes for sale and charity and delivers bicycles to under-served communities around the world. The event will also be supporting Trips for Kids, a non-profit organization that provides mountain bike outings and environmental education for high-risk kids who otherwise would not be able to have these experiences. Or if you don't have a bike to donate, consider browsing the Vision Quest Sidewalk Sale. Cyclists and triathletes can save on new gear including PowerTaps, road and triathlon bikes, cycling shoes, wetsuits, trainers, bike components, and race wheels. Or clean out your closets for all those cycling and tri items you have never gotten around to using and unload it at the sale in hopes of sending it home with someone else. Need more details? 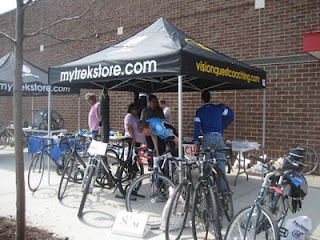 Contact the Trek Store at www.trekhp.com or call 847-433-8735. Photo grabbed from Vision Quest Coaching's Facebook page.